As it is becoming customary to celebrate Apple Days across the country including the pressing of apples to make juice I felt it might be useful to expand the advice on composting apples. Any composter who does not have their own fruit trees or access to the pulp from an apple day may find that the local allotment, community garden, local park or farmer with a small orchard may be happy to allow the collection of bruised or rotting windfalls. In towns a local juice bar may be pleased to have the pulp removed for free. 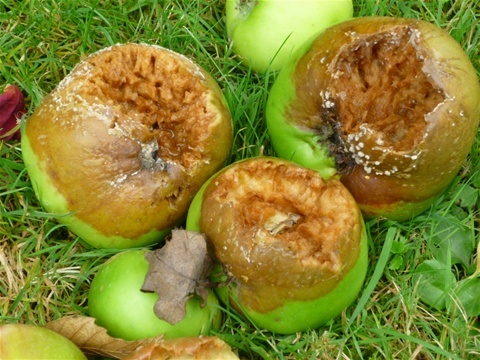 Under normal circumstance apples can be added to the composting as and when they are no longer suitable for eating and this includes the occasional windfall during the summer months. Chopping the apples will of course speed the composting process. However in the autumn larger numbers become available together with the mushy pulp resulting from juice extraction a slightly different approach is needed to deal with the sudden influx of “greens” into the bin or heap. If creating compost heap or using a New Zealand bin the minimum size recommended is 3cu feet. Smaller heaps will breakdown more slowly and will need more frequent turning to keep the composting process working. Where there are a lot of apples it is best to layer them with browns and continue making alternate layers of apples and browns until all the windfalls have been used. If you only have a few trees it might be better to collect the apples in some kind of storage container i.e. a bucket or bin so that you have enough to make several layers about 4” thick at the same time. If possible other greens should be added at the same time as the chopped or pulped apples to introduce air spaces and variation into the green mix. Creating the correct green brown ratio is important so as to prevent the apples fermenting and producing an unpleasant smell. One part green to two part brown material is recommended but if the fruit is going to form a high proportion of the compost heap the addition of a bulking agent to absorb the liquid and provide plenty of free air spaces (FAS) to maintain aerobic decompostition is recommended. For more details on bulking agents please see the page on Food Composting. For the first week the material should be turned daily to aerate the material ensuring that microbial activity heats the content. When turning move the material on the outside of the pile toward the center. This can be reduced as the effect decreases. See the section on hot composting if you have a thermometer monitoring the temperature it can provide additional interest (especially for children). Do continue to check the compost condition of the bin weekly. If it becomes to dry it will stop working while if too wet anaerobic bugs will take over and the temperature will fall and the smell will increase. If dry add water a little at a time, if wet add more browns e.g. dry leaves. After two or three months the compost should be finished dark brown in colour with an earthy smell and no apples identifiable. If you have fewer apples and intend to add them to a bin already in use a simplified techniques can be used. When using cold composting techniques the pile will not get hot enough to sterilize the apple seeds, or you might jfind that an orchard is being sown when the finshed compost is spread . Apples can also be trench composted where space is available in the garden to dig and leave the trench for two years for the apples to decompose. A trench is dug across the garden at least twelve inches deep; a depth of two spits is often used. The soils removed is placed allow the side of the trench. A four to six inch layer of apples can be put into the trench and covered with the soil removed when digging the trench. This will create a small mound which will sink as the apples decompose. Traditionally runner beans or marrows are planted on the trenches. If being used for marrows, squashes or beans planted in wigwhams the circular "trench" can be dug rather than one across the plot. Although fruit pulp is not nutrient rich in itself, the fruit seeds contained in it contain nitrogen, phosphorus, and other plant nutrients that would normally provide nutrients for the germinating plant. This will be a useful addition to the compost heap. In general food waste has a high moisture content and as it is broken down water is released into the composting vessel and as a result the structure of the composting material will not contain sufficient air spaces for aerobic composting and the food will decomposes into a wet, smelly sludge. This can be avoided by the use of a bulking agent to add structure (or bulk) to the compost and create air spaces allowing air to circulate within the composting material. A good bulking agent will also absorb the liquid from the food to maintain the correct moisture content of the food waste during composting. I have included more detail on the use of bulking agents when composting food in the page on food composting. Apple pulp can also be added to the wormery as it is wet and almost liquid in form it will be easy for the eat and the large surface area, compared with a whole or segmented windfall apple will result in faster microbial decomposition but the pulp will need to be supplemented with other food to provide a balanced meal. The material left after draining can be added to the wormery in thin layers between or mixed with paper or cardboard to absorb additional moisture. The fruit pulp should be covered with the paper or cardboard to reduce the fruit fly population that will accompany the addition of fruit to the wormery or compost bin. The same applies to other fruits such as apricots, avocados mangos. nectarines, peaches, and even cherries although the stones are much smaller. The stones from the larger fruit such as plums could be removed before composting or if your time is limited you could soak the seeds in water(hot water is best) this is said to speed up the decomposition process a little.